Knights of Creativity Spirit & Ale: Sir Hook Does the Hanky Panky! 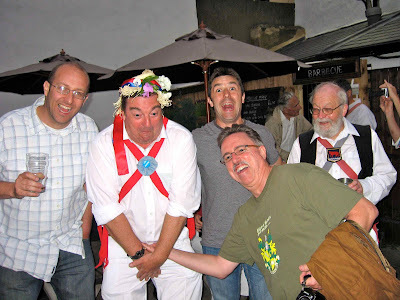 KMSA Date: July 10, 2009...Sir Hook does the Hanky Panky with the Scholars & Gentlemen Morris Dancers outside the Bear Pub in Oxford! After being introduced to Morris Dancing a year early in one of Sir D's excellent and informative blogs...we had to check it out. 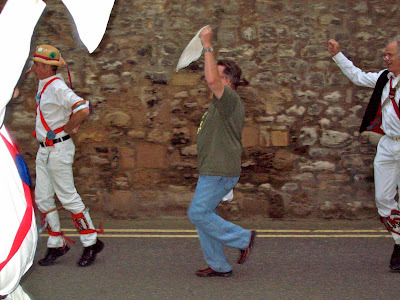 While on our way to Magdelen Arms to catch the rock band, Red Ox, we came across the Morris Men outside the Bear Pub. 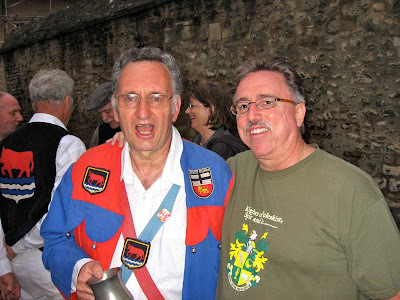 First, we Endeavored to Engage with beers and conversation...which led to filming them...which led to Sir Hook waving his Hanky with great enthusiasm as part of the Morris Men through the streets of Oxford. Sadly, there is no footage of the Hooky Hanky Panky, but this little shuffle with a rather handsome female still tells the tale! As we bid our farewells, the Scholars & Gentlemen told me that I was a "natural" Morris Man and should explore joining a group in the States. I prefer to save the experience for a return trip to Oxford some day. Remember, you can Dance if you want too! It's all part of Thinking...Drinking...and Being Merry! Oh my......watching that video....I had an early 80s flashback to that Men Without Hats video: Safety Dance!! !